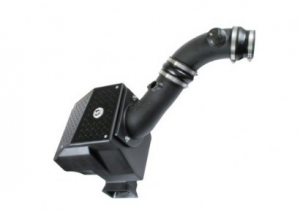 The Stage 2 Si Cold Air Intake System is for those who want a substantial performance gain with less intake noise and a stock appearance. It replaces your factory, restrictive air intake system with the massive aFe performance air filter of your choice, a sealed plastic air box that isolates the filter from engine heat and quiets intake noise, and a rotomolded plastic intake tube with smooth bends for increased airflow volume. The increased flow of cooler air to your engine will result in noticeable gains in power and performance. Cooler, denser air contains more oxygen, and more oxygen in your engine's air intake charge means better combustion, resulting in greater engine output. The Pro GUARD 7 air filter delivers increased airflow while providing the highest level of filtration efficiency available - 99.7%. The patented 7-layer progressive cotton/synthetic media in the Pro GUARD 7 consists of 5 layers of progressively finer medical grade cotton gauze, combined with 2 layers of non-woven synthetic polyester fabric with random porosity. Competitors use constant size mesh gauze in their filters, which creates voids/openings that can allow dirt to pass through. As the progressively finer layers of gauze are stacked in the Pro GUARD 7, the randomness of the openings increase, minimizing spaces with no filter media. Dust accumulates on multiple layers, increasing overall dust holding capacity and filtration efficiency. The pleats in Pro GUARD 7 filters are evenly spaced for greater dust holding capacity and the tips are rounded for better airflow. They're also 30% deeper than comparable aftermarket air filters for longer service intervals and greater dust holding capacity. The sealing surface and supporting structures are made from 100% polyurethane, to withstand extreme engine temperatures. The one-piece sealed plastic airbox may install in the same location as the factory airbox, but there the similarity ends. The Stage 2 Si airbox is much larger inside in order to include the largest aFe filter possible. The air box also features strategically located openings and scoops to ensure that only the coolest air is forced into the air filter for greater efficiency and performance. And enclosing the air filter also results in less intake noise. The Stage 2 Si airbox installs easily; no cutting or drilling is required, and it's attached with quality stainless steel hardware supplied with the kit. A specially developed 3-angle velocity stack smoothes the airflow transition from the air filter to the rotomolded intake tube. The precision design and smooth contours of the intake tube maximize airflow volume and speed for optimum power gains. The intake tube also features a precision tuned MAF sensor pad, which will not affect engine performance or cause a CHECK ENGINE light. The aFe Stage 2 Si Cold Air Intake System comes complete with everything necessary for installation, including comprehensive instructions. It's backed by aFe's limited 2-year warranty and made in the USA.